Ford Fusion is the ideal combination of ahead-of-trend tech features married to eco-friendliness. Our team members at King Ford think the Fusion's tech features and fuel economy make it a popular mid-size sedan among individuals and families. Here are two tech features to prove you what we mean. 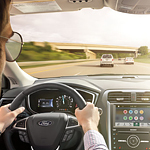 The Ford Fusion comes with a five-year trial of SiriusXM Travel with Travel Link, all controlled through a voice-activated touchscreen. You get 150 channels of commercial-free sports, news, entertainment and exclusive content. You also get 3D maps linked with GPS for accurate voice-navigation, travel info, weather and gas station locations along your route as well as gas prices. Ford Fusion's FordConnect creates a powerful in-cabin Wi-Fi network with 4G LTE speeds powered by AT&T. Connect up to 10 devices, and enjoy a strong Wi-Fi signal within a 50-foot radius of the Fusion's wireless hub. Surf, stream or download on the road or at the beach. Experience the Ford Fusion first hand. Swing by our Ford dealership today for a test drive.